No one is calling a clear winner for the Big Game Sunday Night. As numerous sports analysts have pointed out, it is rare that both of the best teams from the past season actually make it to the Super Bowl, but this year the Seattle Seahawks and Denver Broncos match-up should make for a truly exciting game. While the game will likely be close, Bing says the Seahawks have already been dominating the Broncos online. Bing examined U.S. search volume for both NFL teams, and the Seattle team has taken the lead in 33 states. Obviously, the Seattle Seahawks absolutely dominated searches from The Evergreen State (95 percent), but they also have a clear lead in Oregon (82 percent), Idaho (79 percent), Alaska (78 percent), Hawaii (73 percent), and California (64 percent). 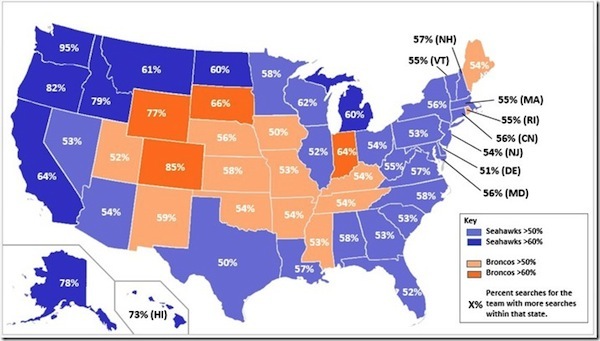 Of the 17 states where the Broncos held the most search volume, they had a less significant lead. Their home state of Colorado had the most significant difference with 85 percent of searches, while neighboring Wyoming had (77 percent). South Dakota and Indiana brought up the lead with 66 and 64 percent respectively. In total, Bing users searched for the Seahawks 26 percent more often than the Broncos. Of course, outside factors could explain the differences in search volume. As Search Engine Watch points out, searches for the Seahawks spiked across the nation immediately following Seahawks cornerback Richard Sherman’s infamous post-game interview. The controversy and excitement surrounding the over-the-top interview made the Seahawks’ search volume jump over 80 percent. The Broncos have had their own moment of viral fame, with tons of clips compiling Peyton Manning yelling “Omaha”, but the larger focus after the Championship games two weeks ago was easily favoring Sherman. Without his spectacular outburst, search volume would likely have been more even across the country. What are you thoughts? Who are you favoring in Super Bowl 48? 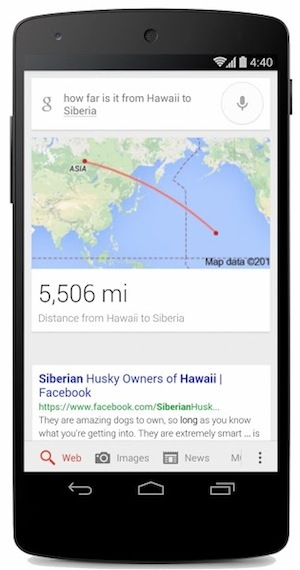 With Google’s constant updates, it is easy to miss some of the new features they roll out with less publicity than their biggest products receive. However, even the smaller revisions to Google Search make a huge affect on how we search and use the internet in general. Jessica Lee recently rounded up some of the less talked about changes Google has been making so you can be sure you haven’t missed anything lately. The Carousel results box at the top of localized searches for hotels and restaurants has only been around for a few months now, and Google is already making regular updates to the function. 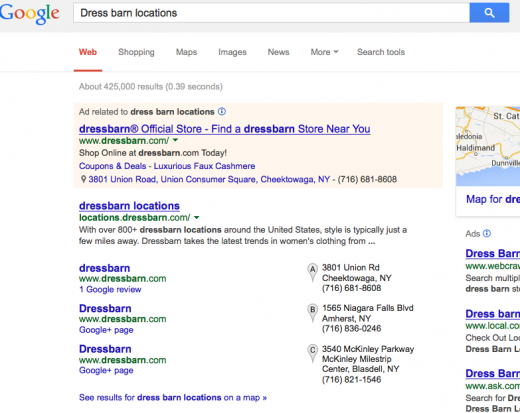 While most of the work has gone into normalizing what queries get carousel results. But, they’ve also implemented some new, interesting features such as a date selector for hotel searches. Now, you can easily weed out hotels that aren’t available on the days you will need lodging. 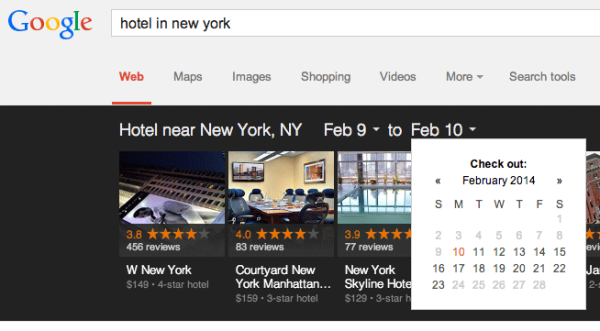 We’re always adding features to search to help people find what they need and get things done faster — you can now more easily research hotels when planning a trip and filter by user ratings and hotel class, as well as select specific dates. The answer cards have also gotten better at providing answers for trickier questions in general. The people running the Google Operating System spent a good amount of time trying to stump Google’s answer feature, but they’ve found the task has gotten much harder as the feature has been improved. Google used to only answer simple questions like “who’s the prime minister of Canada?” or “what’s the population of China?” Thanks to the Knowledge Graph project, Google can answer more complicated questions like “who played Batman?”, “what’s the latest album of Celine Dion?”, “what are the main attractions in Spain?”. 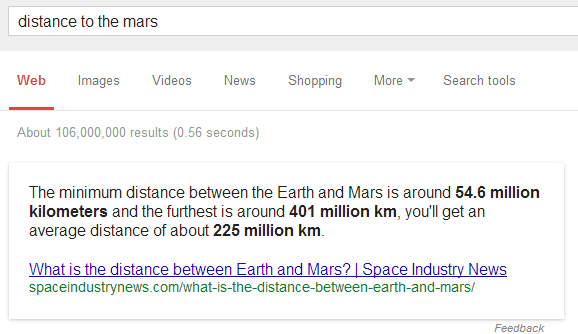 To test this out, one of the authors asked Google a question without a definitive answer: what is the “distance to Mars”. 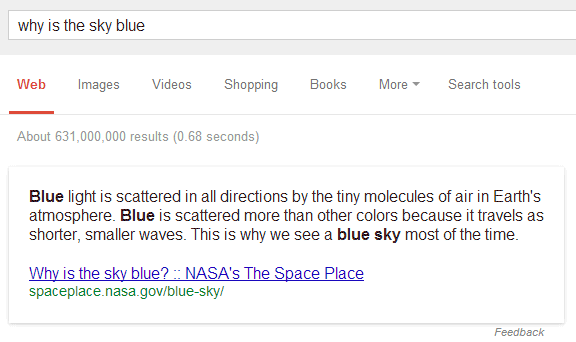 Google can even tell you why the sky is blue. Google removed a few specialized search options that were usually displayed in the “more” drop-down: recipes, patents, discussions, blogs, places. The list of links to services like Maps, Images, News, Flights, Shopping is reordered based on your query. This isn’t a new idea, it was implemented a long time ago by Google, but now it’s used more often. How Does Modern Web Design Affect SEO? Keeping your website design fresh and modern is an important part of your brand, but it is also essential for SEO success. Search engines tend to favor sites which are regularly refining their site to offer new features and better user experience, as Matt Cutts recently confirmed in one of his Webmaster Chat videos. But, there is a lot to consider before redesigning or modifying your website. A good website should be able to feel modern for at least a couple of years before needing another serious overhaul, and you are investing considerable resources into having the site designed in a way that communicates your brand well while keeping up with modern design styles. There are also several factors behind the scenes you need to consider. Great usability and style are important, but several modern design practices seemingly go against some of the biggest search engines suggested practices. If you aren’t careful, you may do some damage to your SEO while trying to improve your site. Kannav Chaudhary recently broke down how some of the most popular web design practices of the moment can affect your SEO. Usability and keeping your brand modern are important, but finding the right style for your brand also means choosing the paradigm which won’t hurt your other efforts. Parallax design recently became popular with web designers for it’s unique way of restructuring a site in a visually exciting way. You build your entire website onto one page, but with responsive scrolling which delivers the content in impressive style. Sites with parallax design are incredibly easy for most users to navigate, as they simply have to scroll through the page, but it raises some issues with optimization. Simply put, most modern SEO practices rely on creating a lot of content over numerous pages so increase the impact of keywords. You show off your skill and reputation through your content, while showing search engines you are relevant for these keywords. When all of your content is on one page, it can dilute the impact of those keywords, and Google can be unsure about how to view your site. The key is really understanding when to use parallax design. 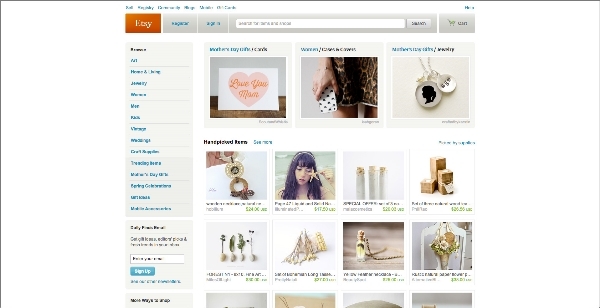 It is great for product or contest pages, because there isn’t much content on those types of sites in the first place. Parallax design can showcase a product and rank for a few key phrases, but it will struggle with presenting a full website to the search engines. If you are pumping out a lot of content on a regular basis, but want it to be easily available from a single page, infinite scrolling can be the perfect solution Social Media sites like Facebook and Twitter popularized the design practice, but it can be found all over the web these days, especially on blogs. If you use the wrong method of implementation for infinite scrolling, you may run into some SEO issues, but the current practices avoid the lion’s share of drawbacks. Most web designers use frameworks such as Backbone or Bootstrap with crawlable AJAX so you can present your information on one page, while avoiding the problems of parallax design. Best of all, it loads quickly, so everyone will be happy. Navigation will always be an important part of web design, and lately many designers have been using fixed width navigation to keep their menus in place while users move down the page. This way, you can always jump to another part of the site you want to find, even when you’re at the bottom of an article. Thankfully, this design practice has very little effect on SEO. 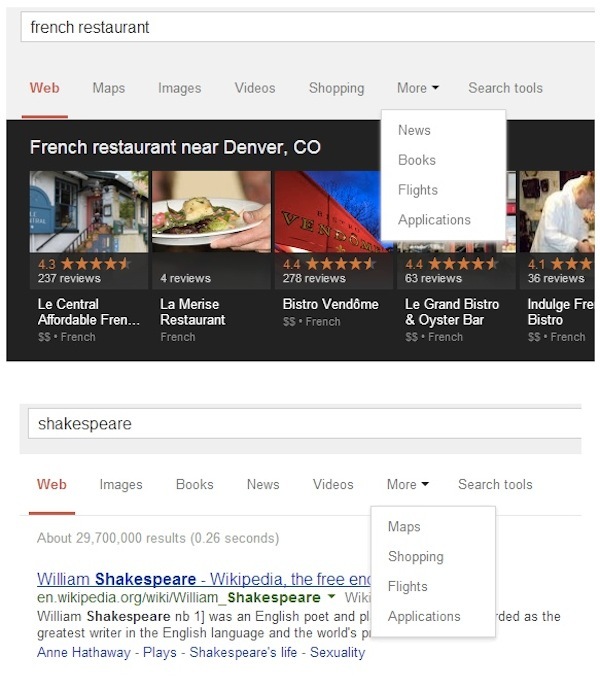 Your content will still be spread over plenty of pages, but you’ll want to make sure your navigation widget is indexable so that Google can also explore your site. At the end of the day, you’ll always want to fully understand the new design trends before implementing them for your brand. Most of the time their SEO drawbacks can be mitigated with careful practice, but occasionally you will find one that just isn’t right for your site. As long as you keep user experience as the highest priority, you’ll be able to manage any of the SEO problems that pop up along the way. Taylor Ball https://www.tulsamarketingonline.com/wp-content/uploads/2018/07/TMO-Logo.png Taylor Ball2014-01-28 14:12:282014-01-28 14:12:28How Does Modern Web Design Affect SEO? As a business trying to keep up with the constantly changing internet, it can be hard to decide which trends to follow and what works best for your business. It is important to have a modern and up-to-date website, but if you chase every trend you’ll often end up falling behind and adopting practices that don’t suit your own business. The biggest decision many web designers and business owners have had to make in recent history is whether or not they should adopt the flat design craze that has swept the web over the past year, or whether they should be using more traditional skeuomorphic design practices for their brand. As the flat design style has become a staple of many big businesses, many brands are also forced whether they run the risk of becoming cliche by picking up flat design or if they will fall behind the times with the older style. If you aren’t familiar with the whole flat design vs. skeuomorphism debate, there has been a major shift in popular web design trends that really gained steam in 2013. Chances are, your web design has relied on skeuomorphic design principles at some point, even if you’ve never heard the word. Skeuomorphic designs rely on recreating objects and visual styles from the three-dimensional world in order to make web design more easily relatable to users. By using stylistic cues and layouts from things such as calenders or notepads, users are immediately able to feel familiar with a website or application. However, as computers, tablets, and smartphones have made technology a constant part of day-to-day life, flat design proponents have pushed for designs that are created “for the screen.” As a guiding principle that is understandable, but flat design activists have translated that mantra into strict stylistic principles as grounded in minimalism as they are web design. Flat designs use simple elements and a strict two-dimensional approach that eschews all added effects such as drop shadows, bevels, and embossing. Flat design has also been heavily associated with the flourishing popularity of more complex typography. The loudest voices for flat design have made it sound as if the new design style is a revolution in how we design, and on some levels it is. The basic guiding principles of “designing for the screen” can open up many new ways of thinking about web design which are fertile for innovation. As a style based on minimalism and strict stylistic rules however, flat design is a trend with more lasting power than some of the more fleeting crazes. It is more important as a business owner to decide what design styles benefit your brand the most, rather than which trends are the most popular at the moment. There are numerous benefits of flat design, but skeuomorphism has been a long standing way of making products and web designs the most usable and familiar they can be for their audience. Plus, as Apple has shown, you can make your designs more flat to benefit usability without entirely going to Flat Design. 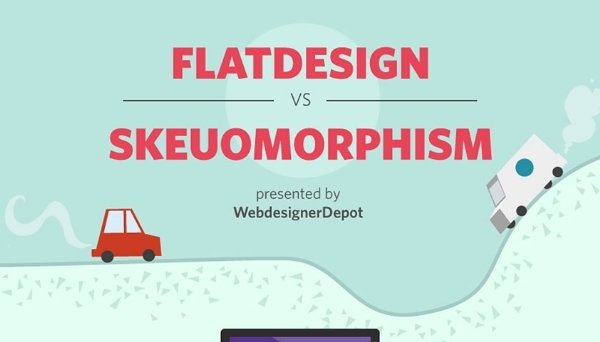 To help you understand which design style benefits your brand and business the most, WebdesignerDepot released an infographic highlighting the biggest advantages and drawbacks to skeuomorphism and flat design. It may help you find which style works for you. 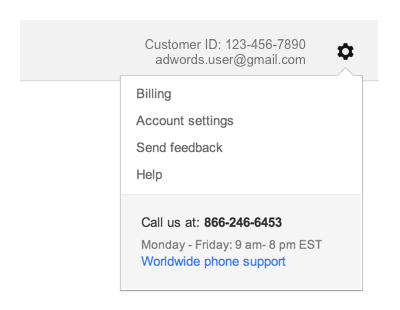 The redesigned AdWords will be implementing several stylistic and functional aspects from Google’s broader network, such as moving navigation links like billing, help, and account setting into the gear icon. You can expect to see the changes appear within the next couple of weeks. 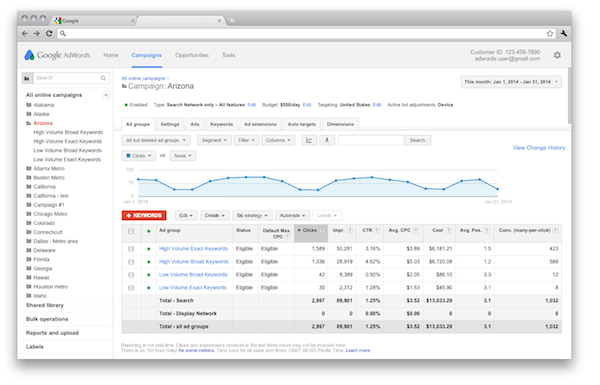 In the meantime you can acclimate yourself to the updates with a short video Google released focused on navigating the redesigned AdWords. It is no secret that nearly every big brand is on Twitter these days, and plenty of smaller businesses are learning to take advantage of the platform every day. But, there are plenty of ways you can mess up when trying to connect with your audience on one of the largest social media platforms around. As a new study on how top brands use Twitter shows, the biggest mistake you can make is simply neglecting your account. The study from social media analytics firm Simply Measured showed that 92 percent of brands are tweeting an average of 12 times a day, and 98 percent of the top brands in today’s market are regularly active on Twitter. In fact, consumers seem to be downright eager to follow brands on Twitter, as audiences for the top brands have grew by 20 percent in the last quarter of 2013. Over half of the brands have more than 100,000 followers each. Of course, it doesn’t matter how often you tweet if you aren’t sharing things that excite the community and encourage engagement. As Marketing Land notes, the tweets with photos or links are more likely to receive activity than the traditional 140 character updates. But, it might be a surprise to see just how much better they perform. Simply Measured says tweets with photos or links see 150 percent more engagement than the brand averages. Images see even more engagement than links by a large amount, with an average of 210 engagements per tweet. 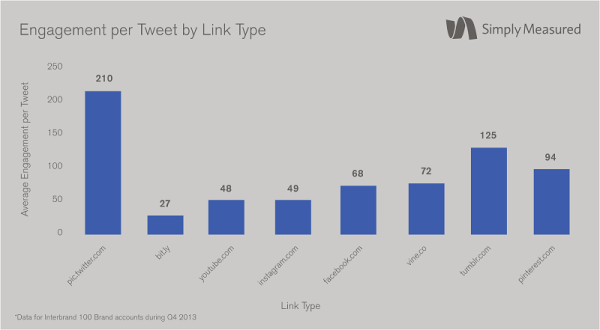 That absolutely dwarfs the 27 engagements on average for a bit.ly link. You can download the full report from Simply Measured’s website. As social media has grown there has been a consistent debate as to whether Google considered social signals when ranking websites. There have been several studies suggesting a correlation between strong social media presences and high rankings on the search engine, but there are many reasons they could be related. Well, Google’s head of search spam, Matt Cutts, may have finally put the question to rest with his recent Webmaster Chat video. According to Cutts, Google doesn’t give any special treatment to websites based on social information. In fact, sites like Facebook and Twitter are treated the same as any other website. The search engine doesn’t do anything special such as indexing the number of likes or shares a page has. Cutts explains that Google did at one point attempt to index social information. Barry Schwartz suggests Matt is referring to Google’s real time search deal expiring with Twitter. There was a lot of effort and engineering put into the deal before it was completely blocked and nothing useful came to fruition. Simply put, Google doesn’t want to invest more time and money into it only to be blocked again. Google is also worried about crawling identity information only to have that information change long before Google is able to update it again. Social media pages can be incredibly active and they may not be able to keep up with the information. Outdated information can be harmful to people and user experience. But, you shouldn’t count social media out of your SEO plan just because it isn’t directly included in ranking signals. Online marketers have known about the other numerous benefits of social media for a long time, and it is still a powerful you can use to boost your online presence and visibility. A strong social media presence opens up many channels of engagement with your audience that can make or break your reputation. It can also drive huge amounts of traffic directly to your site and your content. By reaching out and interacting with your audience, you make people trust and value your brand, while also encouraging them to explore your site and the content you offer. Google notices all this traffic and activity on your site and rewards you for it as well. Pinterest is quickly becoming one of the most popular social media networks out there. Over the span of a few short years, Pinterest has become more active than almost any platform available aside from Facebook and Twitter and it shows no signs of slowing. This has attracted the attention of many businesses and marketers hoping to showcase their brands and engage their audience, but many brands don’t want to do the heavy lifting to become a popular Pinterest presence. Rather than build from scratch, a fair number of professional Pinterest accounts have turned to purchasing Pinterest followers and re-pins in an attempt to create their pages appear more active and increase their visibility. The reason these types of artificial follower markets become so popular is that they do exactly what they say in the short term. It is true that unfamiliar visitors will be more likely to follow pages that appear active and popular among the community. But, there are plenty of downsides to trying to manufacture a facade of activity and engagement. As with most other social networks, Pinterest uses an algorithm to determine the visibility of pins and profiles based on popularity. John Rampton coined the term Pinrank for the algorithm in reference to Facebook’s old Edgerank algorithm. When your posts draw lots of activity, Pinterest increases your visibility and shows your pins to more people. Likewise, if your nobody is interacting with your pins, you will become less relevant. While purchased followers and re-pins can trick the average visitor into believing your content is popular, Pinrank sees right through your shenanigans. The best case scenario for those purchasing pins is a quick surge in popularity, followed by an immediate decline as real followers come to see that your content isn’t relevant or important. As that happens, your Pinrank will naturally fall despite your seemingly huge number of followers. The worst case scenario ends in being entirely banned from Pinerest. Only a few accounts have been banned so far for the blatant violation of Pinterest’s Uses policy, but Pinterest is entirely aware of the shady tactics rising in popularity and there will likely be quite a few more bans in the future. Even if you’ve invested months of real work into cultivating your Pinterest page, all of that can be gone in an instant if you are purchasing followers. In the end, buying Pinterest followers won’t benefit you anymore than buying property on the moon. More than likely, it will hurt your brand and it’s reputation more than any upsides you will ever see from the practice. All it is really is an attempt to cheat the system. Everyone knows that Google is a fan of hiding little easter eggs throughout their services, especially in Google Maps and Google Earth. Many of the most well known “secrets” of Google Maps involve objects that actually exist in real life, such as the popular giant pink rabbit in Italy. However, Google also creates some fun little tricks on their own. I learned of two such treasures this week and thought I would share them with you. The first has been around for a few years, but it recently began making the rounds again. 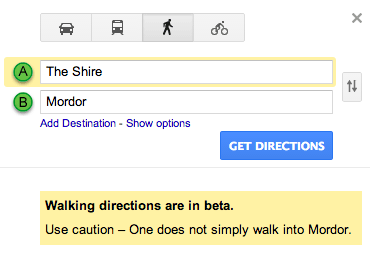 Michael Gray on Twitter noticed that Google Maps gives a particularly funny response if you happen to search for walking directions from The Shire to Mordor, as you can see below. It is a good time for the little trick to be popping back up, considering the new The Hobbit film is just now leaving theaters, with one more on the way. Plus, many like me never saw it when it was first discovered in earlier versions of Google Maps. The other secret Google Maps holds is much newer, but equally (if not more) exciting for the fans of Doctor Who. 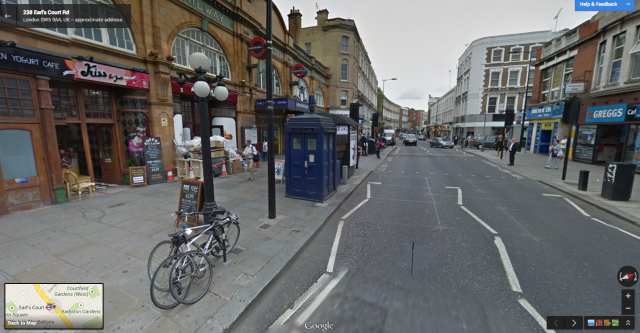 It seems the Tardis was hiding inconspicuously along Earl’s Court Road in London when the Maps team was in the area, because stepping into the blue police box sitting nearby when using Streetview. 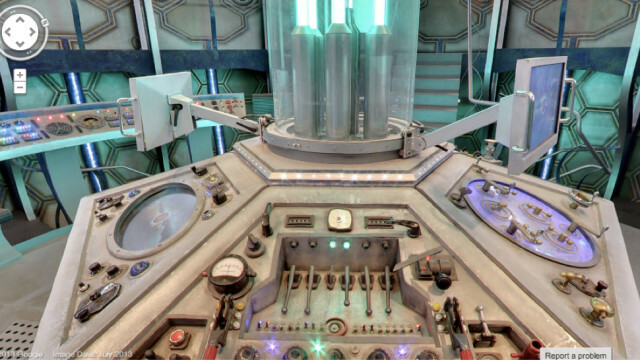 If you click on the double-white arrow, you’ll notice the police box is bigger on the inside, and you can explore the (limited) depths of the Tardis, The Doctor’s infamous time machine. Of course, it doesn’t have the endless new rooms and corridors that often appear in the show, but you get a good look at the controls and interior. What is your favorite Google Maps easter egg? 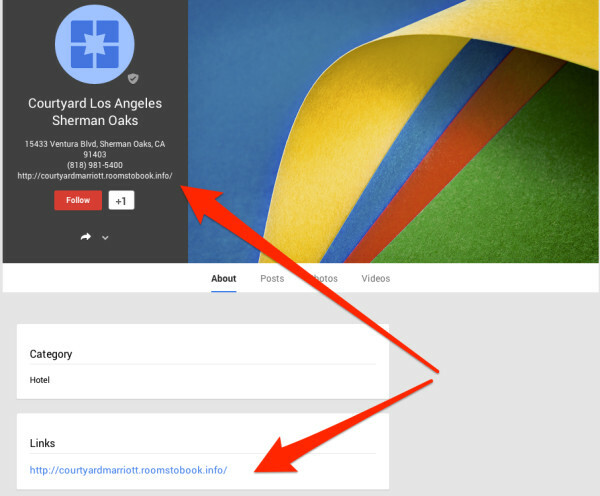 Yesterday we reported on the mass hijacking of thousands of Google+ Local listings. 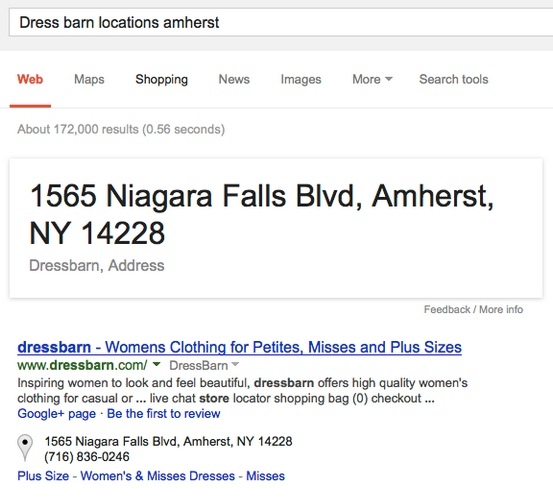 In short, over a short period of time a huge number of hotels with business listings for Google Maps and Search. The story was broke open by Danny Sullivan from Search Engine Land, who attempted to track down the source of the spam attack, with no concrete evidence to suggest who the culprit actually is. While the issue could have a big affect on many businesses it the hotel sector, it is more notable for showing that other attacks could happen in the future. Even worse, no one outside of Google has been able to explain how this could occur, especially with the number of big hotel chains affected. The hotels hit with the spam weren’t mom-and-pop bed and breakfast places. Most of the listings were for huge hotel chains, such as the Marriott hotel shown in the example of a hijacked link below. If Google does know how this was able to happen, they aren’t telling. In fact, Google has been terribly quiet on the issue. They’ve yet to issue an official public statement, aside from telling Sullivan that he could confirm they were aware of the problem and working to resolve it. We’ve identified a spam issue in Places for Business that is impacting a limited number of business listings in the hotel vertical. The issue is limited to changing the URLs for the business. The team is working to fix the problem as soon as possible and prevent it from happening again. We apologize for any inconvenience this may have caused.